Even though all of us awoke at 6:30am (I was the last one to wake up for a change), we spent the majority of the morning slowly having brekkie, tending to Tahia’s needs, and giving laundry to Julie’s mom, who would bring the stuff to the relatives’ place in Everett. Apparently, coin-op laundromats in downtown Seattle were a thing of the past and the only ones available were those that charged by the piece. After having had the most expensive laundry job ever in Loen, Norway using this method, we weren’t about to do that again here in Seattle. It wasn’t until about 11:20am when we were finally in the car with Tahia. The late start meant that we wouldn’t be able to meet up with Emily (a friend from high school whom I hadn’t seen for decades) at the hoped-for time of 1pm (when she could take work off). Instead, it would be at least 2pm. 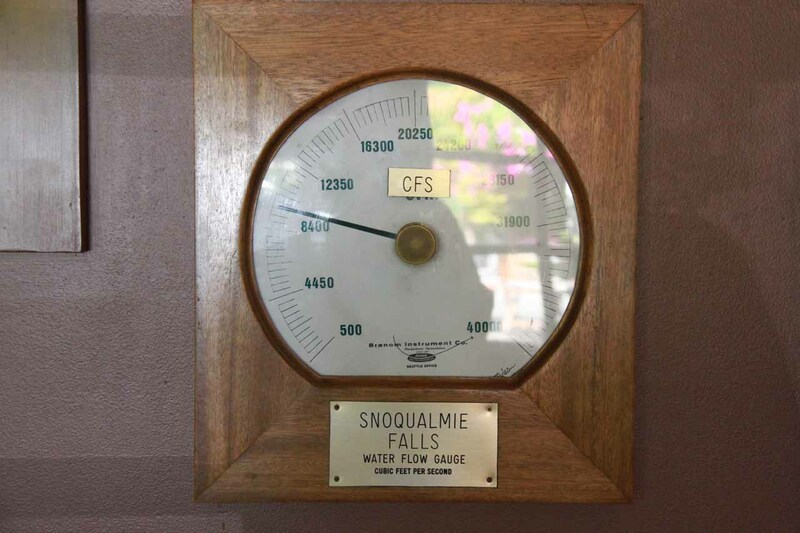 Anyways, the first order of business was to re-visit Snoqualmie Falls, which we got to at 12:05pm on this warm and sunny day. It seemed that lots had changed in five years. 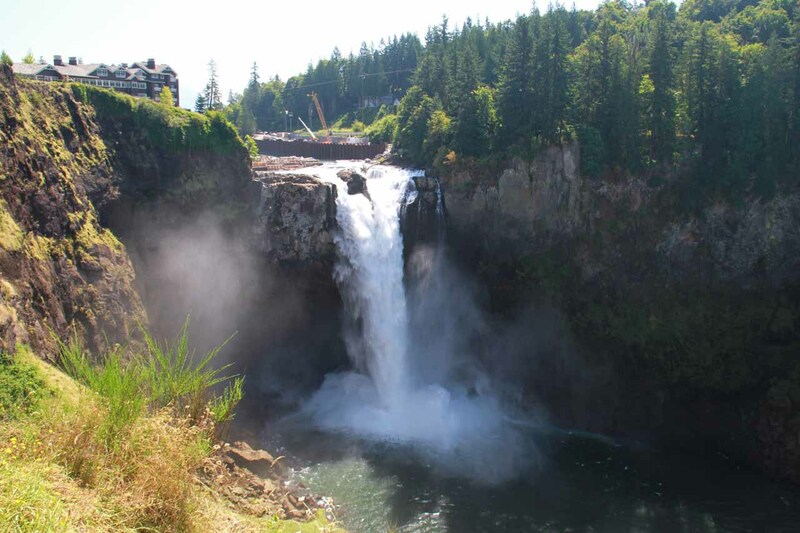 For starters, there seemed to be a lot of construction work upstream from the falls itself. Plus, they closed the trail leading to the river level and the lower viewing spot until 2013! They also closed some of the lower viewing decks, including one with a shelter. 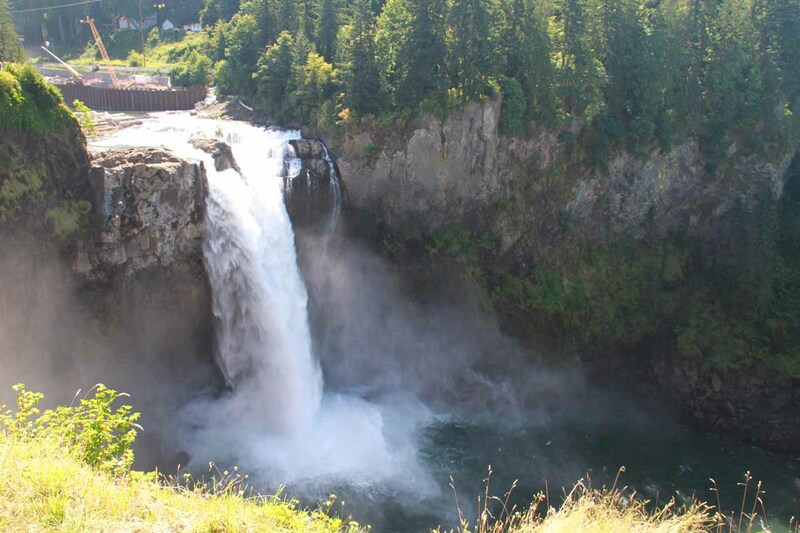 Nonetheless, our visit to Snoqualmie Falls was less so about waterfalls and more so about tending to Tahia’s needs again. You see, she pooped as soon as we showed up. So it took some time to get her cleaned up. Then, we fed her milk as she was due for her feeding. When all was said and done, it wasn’t until about after 1pm when we finally got to take photos of the falls in the high summer sun. Shadows were still covering parts of the falls so it wasn’t like the best photography situation (then again, when was midday ever a good time to take photos?). But with all our limited options, there really wasn’t a whole lot to do here. At 1:35pm, we were back at the car. Even though we ended up spending twenty minutes enjoying the falls, it still was a ninety-minute visit thanks to tending to Tahia. Once in the car with the AC on full blast, Julie had to pump once again, and we let Emily know that we were on our way. We also finally got a hold of Lindsey, who was a Seattle local who briefly moved down to LA for work, and that was how we got to know her. So logistics were set for both meetups (one very soon today and the other tomorrow midday). 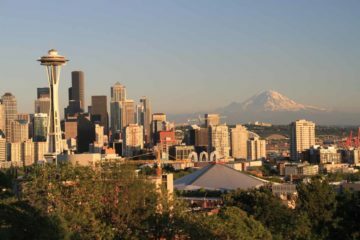 We were to meet Emily at Kerry Park for a view of the Space Needle as well as Mt Rainier. We eventually got there at 2:35pm. 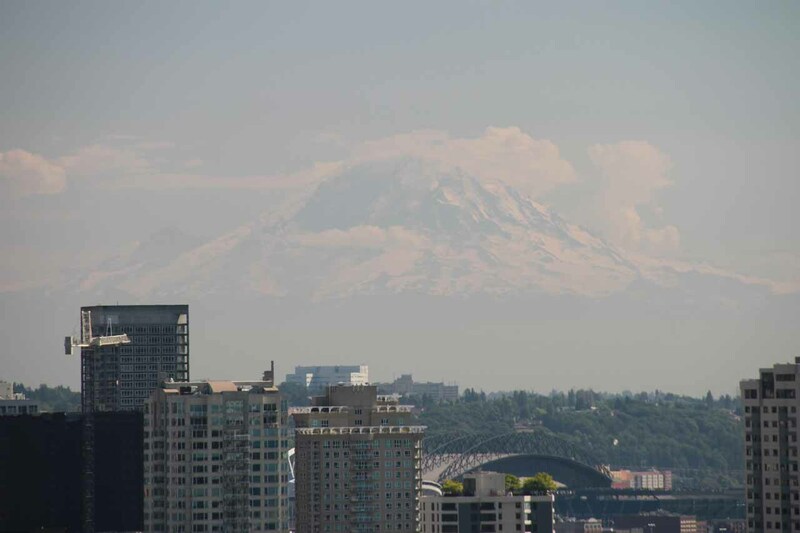 Mt Rainier was visible, but in the brightness of the day, it was a bit hazy. I’m sure late afternoon photos from this spot was the way to go, especially if Mt Rainier was to have alpenglow from the setting sun. We took the obligatory photos here and then noticed some people were taking professional shots here. We had no idea what was all that about. All we knew was that we were chatting in their photo shoot and were told to move. After getting re-acquainted with Emily, we chilled out at this cuban place called Paseo in the suburb of Fremont. After finding parking and then feeding Tahia, we finally met up with her at the little dive at 3:40pm. The place was actually a little stuffy shack, but it turned out that the Cuban food was better than Portos or Versaille, which was the Cuban fare we were familiar with back in LA. Sure the sandwiches were messy, but damn the Cuban Roast really hit the spot. So we did a bit of chatting over the Cuban food, learning about Emily’s dental business, finding out who she still keeps in touch with, and learning a bit more about the scene in Seattle. She definitely had an aversion to Pike’s, especially given the difficult parking situation, and we could totally relate if you’re from the area. Sometimes it’s just too much trouble to even bother like the LA beaches. Tahia was getting a bit antsy and shrieking loudly in the confined shack. So I took her for a bit of a walk in a stroller while Julie and Emily got to mingle a bit. At 5:30pm, we left to go check out a gelato place called the Fainting Goat. We got there in 15 minutes though parking wasn’t exactly easy to find. In any case, we got some creamy gelatos there while mingling a bit more while also entertaining Tahia. Julie was pumping and joined us another 15 minutes or so later. By 6:40pm, Julie and I were worn out by Tahia, and we had to get back to our hotel so we could accommodate Julie’s mom when she returned. There was only one set of keys and we had it. So we parted ways with Emily holding out hope that we could return in the future so she could show us a few more foodie spots. I’m sure Julie really looked forward to that being a foodie herself. After fighting a little bit of the downtown Seattle traffic, we were back at the car park at 6:55pm, but then we still had to take some time to get the stuff organized for the walk from the car park back to the hotel. It wasn’t until 7:20pm when we were back for good and called it a day.